Home Client Side Object Model (CSOM) List Permission PnP PowerShell PowerShell SharePoint Online SharePoint Online: How to Break Permission Inheritance using PowerShell? SharePoint Online: How to Break Permission Inheritance using PowerShell? 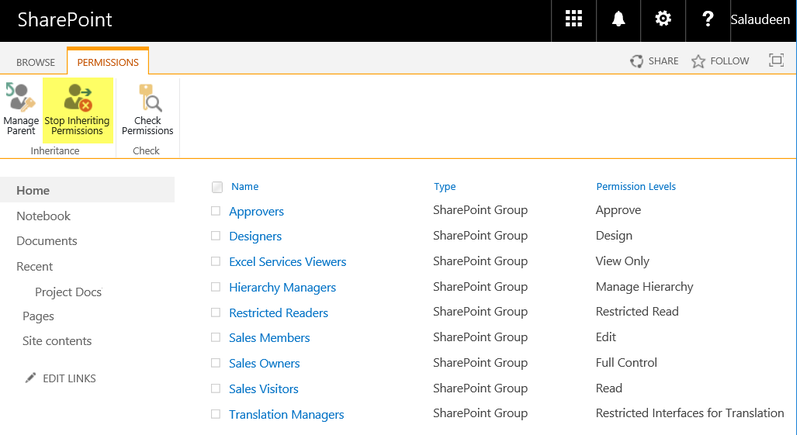 Requirement: Grant permissions at list or library level to users and groups in SharePoint online. The particular user group has read access at site level and the requirement is to provide Edit access rights on specified lists and libraries. When you provide permissions at the site collection, any securable object under the hierarchy, such as sub-sites, lists and libraries, folders, documents & items inherit their permissions from their parent. However, there are situations where you want to provide granular permission to any of these securable objects by assigning unique permissions. In the permissions page, if the list is inheriting permissions from parent, we have to break the permission inheritance by clicking "Stop inheriting Permissions" button. Confirm the prompt once. Now, you can add or remove users to the particular list or list item permissions by clicking Grant Permissions button from Grant group. Once you stop inheriting permissions - All users & groups are copied from the parent object to the child object. From this point, Any future permission changes made to the parent object no longer affects the child! Here is the PowerShell for SharePoint online to stop inheriting permissions from the parent. write-host  -f Green "Permission Inheritance Broken for All Items in the List '$ListName'"
Lets add some error handling to this script and break permission inheritance of a list. Write-host -f Green "Permission inheritance broken successfully!" Write-Host -f Yellow "List is already using Unique permissions!" Write-Host -f Green "Permission Inheritance Broken for List!" This script uses "CopyRoleAssignments" switch to copy permissions from the parent. You can use "ClearSubscopes" to clear permissions!